COMMENTARY ON "A ROYAL PRIESTHOOD"
This week’s lesson uses Peter’s metaphor of living stones being built onto the cornerstone that had been rejected—believers being built upon the Lord Jesus—but presents this idea “inside-out” from the way the Bible talks about it. 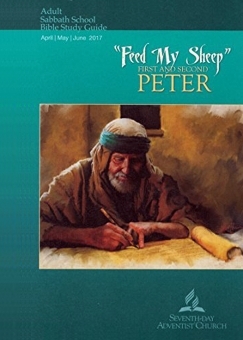 Peter, however, is not pointing to the Old Testament to explain truths about how Christians should live. Rather, he is showing how the Old Testament concept is fulfilled in the church. I realize this difference may seem like mere semantics, but it is important. Adventism anchors itself in the Old Testament law of Israel and claims Israel’s covenant and covenant sign as its own. This backwards direction, however, is wrong and leads one far astray. If a person looks to the Old Testament to figure out how to live as a Christian, he will be looking away from the finished work of Christ that fulfilled the law. Instead, Peter is using the familiar words of his readers’ Scripture to say that now they have a new reality. They no longer go to the spiritual house of the tabernacle where God’s presence resided and where the law lay. Instead, they themselves ARE the spiritual house, and the sacrifices that ascend to God from the “spiritual house” are now those “acceptable to God through Jesus Christ”. The Old Testament is not informing them. Now, the sacrifices Israel offered have been completely fulfilled in Christ’s one-time sacrifice for sin. The Israelites no longer have to bring sacrifices in order to contact God. Now, they carry within them, if they are born again, the guarantee of the Holy Spirit that the sacrifice of Jesus precedes them into the presence of the Father. Now, the sacrifices of the living spiritual house are the acts of submission and obedience as they submit their still-sinful flesh to the authority of the Lord Jesus and allow Him to keep them from indulging their natural desires. This submission of one’s life and decisions and behaviors—a submission that is impossible for anyone not born again—to the Lord Jesus is the spiritual sacrifice acceptable to God through Jesus Christ. Tuesday’s lesson is dedicated to explaining how the church, and Adventism in particular are God’s “covenant people” in the same way Israel was. This argument is contrived, not based in Scripture. First, the lesson blurs the distinction between the eternal, UNCONDITIONAL covenant God made with Abraham, and the Mosaic covenant which God made with Israel—a CONDITIONAL covenant based on both His and their promises to each other. God’s covenant with Abraham did not involve any promises from Abraham. In fact, God did not allow Abraham to participate in the covenant but put him to sleep as He Himself moved around the covenant sacrifices in the form of a smoking pot and burning furnace (Genesis 15). God promised to give Abraham seed, land, and blessing—and to make him a blessing. He promised these things unilaterally and place no conditions upon Abraham. God’s promises are certain and cannot fail; they are also eternal as He is eternal. The Mosaic covenant, however, was CONDITIONAL. It involved both God’s declarations and also Israel’s promises, and it was set up as a conditional agreement: blessings for obedience, curses for disobedience. It had a beginning and an ending—430 years AFTER Abraham UNTIL the Seed (Galatians 3:17-19). Christians are grafted into the New Covenant promised in Jeremiah 31:31-33. It is the fleshed out fulfillment of the Abrahamic covenant, and it, too, is UNCONDITIONAL. God promises to give His people a new heart and to write His law on their hearts, and there is no condition attached. God unilaterally makes these promises without conditions. It, too, is eternal. Only the Mosaic covenant is temporary and conditional. Adventists, furthermore, are not the “covenant people”. First, they are not Israel. Second, they are not grafted in by faith, by believing as Abraham believed. Rather, they have a false gospel as defined in Galatians 1, and they have an incomplete atonement with Christ completing it in heaven—a teaching blatantly missing from Scripture. The lesson and Ellen White blur the Abrahamic covenant with the Mosaic covenant and claim that the Mosaic is a restatement of the Abrahamic. Nothing could be further from the truth. The lesson (and EGW’s quote in it) also suggest that God’s covenant with Abraham included the “covenant people” keeping His requirements. Again, this detail is utterly absent from Scripture. (Read the details in Genesis 15). Adventists are not part of any “covenant people” as an organization. In order to be included in the new covenant, we must believe in the finished work of the Lord Jesus. Then, His unconditional promises are ours. Finally, this lesson applies Peter’s “priesthood” language to “Seventh-day Adventist Christians” (p. 35 of the Quarterly). Again, those who are the living stones and the royal priesthood are those who, through their belief in the Lord Jesus Christ, are adopted by the Father and grafted into His church. Every believer is part of a “royal priesthood”. No one who embraces and teaches a false gospel is part of this royal priesthood. Rather, it depends entirely upon our belief in the Lord Jesus and His finished work. The point of being a royal priesthood is not figuring out how to live up to this calling better. Rather, when one is a true believer, the essence of being part of the Father’s royal priesthood is learning to submit to Him, to trust His promises, and to submit our own ideas and dreams to Him, allowing Him to the One in charge of our lives, the timing of events, and of sanctifying us. We do not know what we actually “need” nor what we actually must “do”. The Lord who saved us knows, however, and He has created works in advance for us to do when we believe in Him (Eph. 2:10). Copyright 2017 BibleStudiesForAdventists.com. All rights reserved. Revised April 5, 2017. This website is published by Life Assurance Ministries, Camp Verde, Arizona, USA, the publisher of Proclamation! Magazine. Contact email: BibleStudiesForAdventists@gmail.com.